Seven_legion@aol.com ransomware uses sophisticated techniques to infiltrate computers and hide from its victims. Use Reimage to determine whether your system is infected and prevent the loss of your files. What is known about Seven_legion@aol.com ransomware virus? How can you prevent ransomware attack? How to delete Seven_legion@aol.com virus? Seven_legion@aol.com virus, or 777 ransomware virus, is a critical Trojan horse that starts corrupting all victim’s files as soon as it enters the computer system. This crypto-ransomware virus affects files stored in the vast of computer folders, only bypassing Windi and Program Files folders. It also lets all .exe, .777, .dll and .msi files stay untouched. However, it encrypts documents, photos, presentations, movies, music files, and numerous other files. An important feature of this virus is that it appends a quite long file extension to each file, which looks like this: ._[DAY-MONTH-YEAR-HOUR-MINUTE-SECOND]_$[EMAIL ADDRESS]$.777. 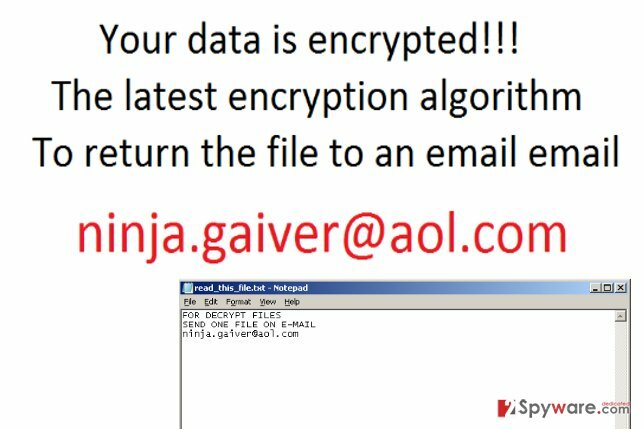 What is interesting is that this virus provides a different email for different victims, either ninja.gaiver@aol.com, kaligula.caesar@aol.com or seven_legion@india.com. Seven_legion@aol.com malware grabs victim’s IP address and registers it on its servers, then creates a ransom note and saves it on victim’s desktop. The ransom note has a quite simple filename, read_this_file.txt, which directly invites the victim to open it. The ransom note does not provide any detailed information about the encryption. It only says “FOR DECRYPT FILES SEND ONE FILE ON E-MAIL [EMAIL ADDRESS].” It seems that cyber criminals are not willing to waste their time writing an informative ransom note and prefer communicating with the victim personally. They ask to send one corrupted file to them so they can prove that they can decrypt it with the Seven_legion@aol.com decrypter. Later on, these crooks asks the victim to pay a ransom to get this decrypter. However, we do not recommend you to waste your time negotiating with criminals and remove Seven_legion@aol.com ransomware using a good anti-malware software, for example, Reimage. To decrypt your files, use this free Seven_legion@aol.com decryption tool created by malware researchers. It is very important to protect the computer from ransomware. In this case, it is possible to decrypt your files, and you should consider yourself lucky to be a victim of a poorly programmed virus. For example, Locky virus and many other ransomware viruses haven’t been defeated yet, and people who have been attacked by them still can’t recover their files. To protect your computer from ransomware, you should get a reliable anti-malware software, plus, create a data backup and save it on an external drive. It is also advisable to keep all your programs up-to-date to prevent crooks from exploiting security vulnerabilities of outdated programs. In addition to that, you should avoid visiting suspicious websites and stay away from email letters sent by unknown people or organizations. Even if you receive an official-looking letter with attached documents, do not open it unless you know who sent it and that you were supposed to get it. Cyber criminals often create emails to pose as representatives of well-known companies and send malicious files concealed and designed to look as secure documents or archives. By avoiding such letters, you can lower the risk of infecting the PC with ransomware. Log in to your infected account and start the browser. Download Reimage or other legitimate anti-spyware program. Update it before a full system scan and remove malicious files that belong to your ransomware and complete Seven_legion@aol.com removal. When a new window shows up, click Next and select your restore point that is prior the infiltration of Seven_legion@aol.com. After doing that, click Next. Once you restore your system to a previous date, download and scan your computer with Reimage and make sure that Seven_legion@aol.com removal is performed successfully. Guide which is presented above is supposed to help you remove Seven_legion@aol.com from your computer. To recover your encrypted files, we recommend using a detailed guide prepared by 2-spyware.com security experts. Cyber security experts have managed to create a free decryption tool that can save files encrypted by this malicious ransomware. You can download seven_legion@aol.com decryption tool here. This entry was posted on 2016-09-09 at 07:45 and is filed under Ransomware, Viruses. You can quickly scan the QR code with your mobile device and have Seven_legion@aol.com ransomware virus manual removal instructions right in your pocket. How did you remove Seven_legion@aol.com virus?